What are you saying Cuckoo fans!? Been a while, been a very busy couple of months for us here at Brindle Distillery, loads to tell you about! We have been all over the place! We had our first proper event of the year down at the London Olympia, a big trade show called Pub19. This was also the first show for our very own Jack Connor, another local lad who you may have seen at our bar nights and if you have been on a tour or workshop. Jack has since joined me on another show up in Harrogate. Basically, we are trying to prize him away from college so he can become the next Mark Long! Just joking Jack! We have been hard at work at the distillery to, plenty of gin being made but also we have our rum now aging in ex bourbon barrels all on view! We have 12 barrels full of rum aging away and we are hoping it’ll be ready in time for this Christmas! Lancashire Rum, what a time to be alive! I have been up in Yorkshire a fair bit as well. We are always well received in Yorkshire despite our historic rivalry, there is over 50 gin distilleries in Yorkshire alone so you’d think there was no room for a Lancashire Gin but alas, they know really that we do things reyt this side of the Pennines! I did a gin festival up in Morley near Leeds as well as spending the day in the City Centre getting new accounts. We have recently been taken on by a wholesaler called Venus, they have many accounts in Leeds, Newcastle and most of all in London so in the coming months I’ll be heading to these areas spreading the Brindle good vibes! Big trip of the month was my week up in Glasgow! Great city, I have worked up there before in my old job, fond memories of my time up there and it was class to go back with Cuckoo. I was up there to promote the brand as we haven’t taken it to Scotland yet and I have to say, the weegies loved it! We are now stocked in The Good Spirits Company, who are based on Bath Street in the city centre. I was told by loads of people that I HAD to get the gin in there so that was my first port of call. They have a serious collection of gins, whiskies, rums and all things alcohol, a wonderful shop and we are super proud to be stocked there now! You can find us in an array of bars and restaurants about Glasgow too, we had a very productive week up there topped off with a 3 day event at the Gin to my Tonic Show in the SEC. We had previously done the Liverpool gin to my Tonic, which proved really successful so we are doing a few more this year. 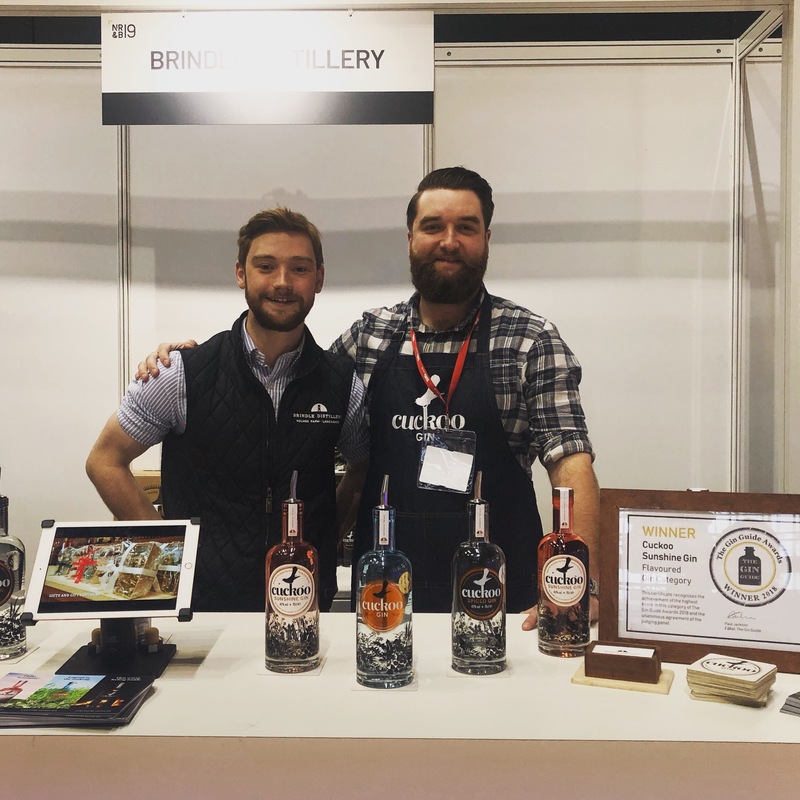 Glasgow again proved very successful for us, we were up against some top brands up there but everyone we spoke to loved the gins, after all when you’ve got myself and William chatting about you probably want to just buy a bottle to shut us up! Back from Glasgow and straight into the NRB Show in Manchester! I used to attend this event when I was in the bar industry and I know exactly how it can get! A great gathering of people from the industry, bar owners, restaurant groups, shops and supermarkets all looking for new products to stock and to try them while they are at it! Another successful show and me and William celebrated accordingly! We have plenty coming up now we are heading into summer, how is it nearly April? Scary how quick this year is going already! Keep an out for us on our travels and don’t forget we have loads going on at the distillery from bar nights to tours and workshops, all information and dates on the website! Thank you all for your continued support, I get some lovely comments out on the road from everyone and it is really appreciated, its the morale we need! Just good people wanting to do good things for our community and beyond. Viva Lancashire.